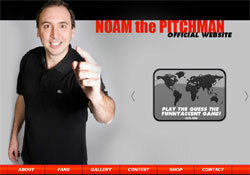 Noam the Pitchman Has a Website! Available for sale is a Noam ringtone and a Noam T-shirt. A photo gallery features old pictures of Noam doing live pitches. Apparently someone is pushing really hard for Noam to become the next Billy Mays…or at least the next Vince Offer!